All children deserve the opportunity to discover and achieve their dreams. 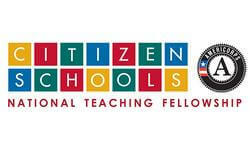 Citizen Schools makes this possible for thousands of high-need middle school students nationwide through partnerships with public districts that extend the school day and introduce volunteer and paid adults to increase hands-on learning opportunities. It’s an evidence-based model, in operation at 31 schools in seven states, that consistently accelerates the rate of student learning, reduces absenteeism, leads to more students reaching grade-level proficiency, and prepares students for college and beyond.